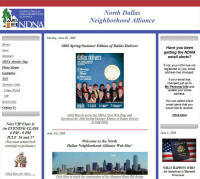 North Dallas Neighborhood Alliance - www.ndna-tx.org. The North Dallas Neighborhood Alliance, is a non-profit organization formed in 1981, to support and represent the Homeowner and Neighborhood Associations in North Dallas. This is a Microsoft ASP.NET 3.5 web site with AJAX. RHO Wireless - RF LAN connectivity for the home and office. Share computers, internet access, and printers without wires! 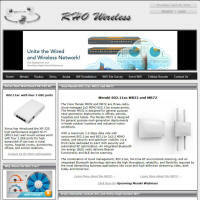 www.rhowireless.com This site has bee upgraded to ASP.NET 3.5 with AJAX and Telerik Controls. 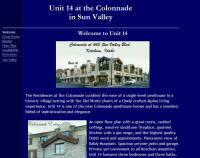 Unit 14 at the Colonnade - Unit 14 is one of the nine Colonnade penthouse homes in the town of Ketchum, Idaho and offers a seamless blend of sophistication and elegance. Sun Valley is the ultimate ski experience and boasts two fabulous mountains, Baldy, considered by serious skiers as the country's single best ski mountain, and Dollar, a beginner's paradise with gentle, sunny slopes, groomed to perfection. This is a basic HTML site.